Always on the lookout for dwarf conifers that really are dwarf and that are easy to grow with a minimum amount of water. This little gem does just that. Forming a spreading and arching shape- much like an anvil, the new growth on this slow grower is tipped in white. It remains showy throughout the year. To 2′ x 3′ in 10 years. Full sun to light shade in any soil. Light summer water to none when established. Adaptable to dry shade conditions as long as the shade is not too deep. Excellent, easy to grow small evergreen. Fits in the smallest gardens. Great in containers, especially winter containers. 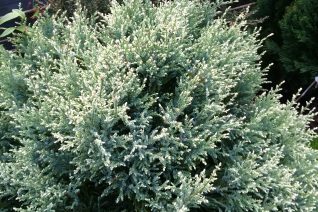 Most native Port Orford Cedars that are grown eventually die out of the root pathogen phytophthera so imagine our delight when this small shrub form with gorgeous white foliage has persisted. Not that its totally resistant but it doesn’t just up and die when it gets water on the first 85ºF day. Really at its best as a stunning container subject where one can appreciate the almost white foliage that slowly morphs to aqua green. A nice bicolor effect. 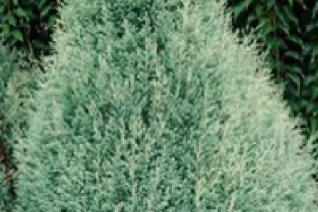 Unlike other variegated conifers this one does not get nasty after exposure to an arctic winter and summer sun. Instead it remains fresh. To 5′ tall and 3′ wide in 7 years- in the form of a tear drop. No summer water once established. Regular water is safe in containers. Part shade to full sun and average, well drained soil. Slow growing conifer that always looks good. Oregon native plant. 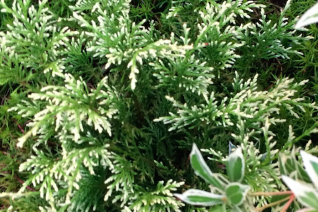 We are so pleased with this useful and striking dwarf conifer. New growth is strongly tied in white before settling to a sea green. Slow growth to 3′ x 3′ in 6 years. Full sun to quite a bit of shade. Soft mein and compact habit make it a great versatile plant. Light summer water though tolerant of regular irrigation. Average soils with reasonable drainage.Good looking year round.